It’s easier than you think to raise your own pork! 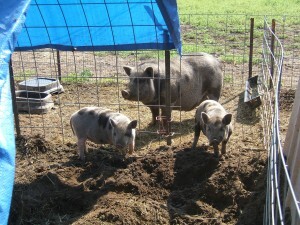 If you have the space and your zoning allows it, you might want to consider raising a couple of pigs. Not only will you have the most delicious hams, chops, and bacon you can imagine, you’ll also have peace of mind knowing exactly what your pigs were fed and how they were treated. While most of today’s pork is raised in unhealthy, confinement factory farms, yours will be a quality AND humanely raised meat. Plus, if you home butcher and cure, you can avoid the nitrates which predominate in commercially smoked and cured pork products today. Pigs are relatively easy to raise, don’t require large pens (despite their size), and are good at converting just about anything feed-wise to meat. 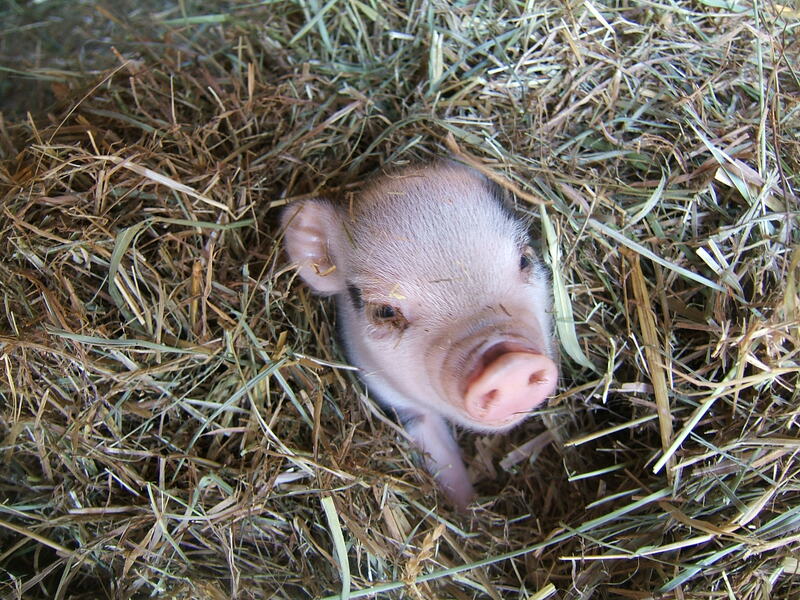 Besides grain, your pigs will thrive on kitchen and garden cast-offs (including weeds), extra milk and eggs, pasture, acorns, grass clippings, hay, dated bakery products, windfall apples, old produce from your local grocery store, and just about anything else you can lay your hands on. With a couple of pigs in the backyard, nothing remotely edible need ever go to waste at your house again! And, in only 6 months, your 30 pound “weaner” or weaned piglet will have morphed into a 200+ pound porker on such a diet. If you haven’t ever tasted home-grown pork (that is, REAL pork) you’re in for a treat. Keep in mind too, a strategically-located pigpen can be next year’s RICH garden bed. 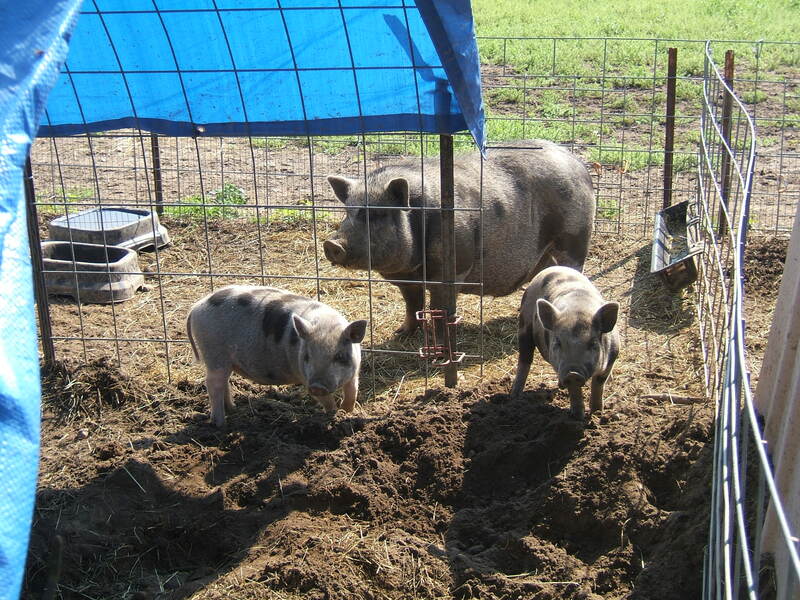 Your pigs will happily turn over the soil, weed, and fertilize any space you put them on. 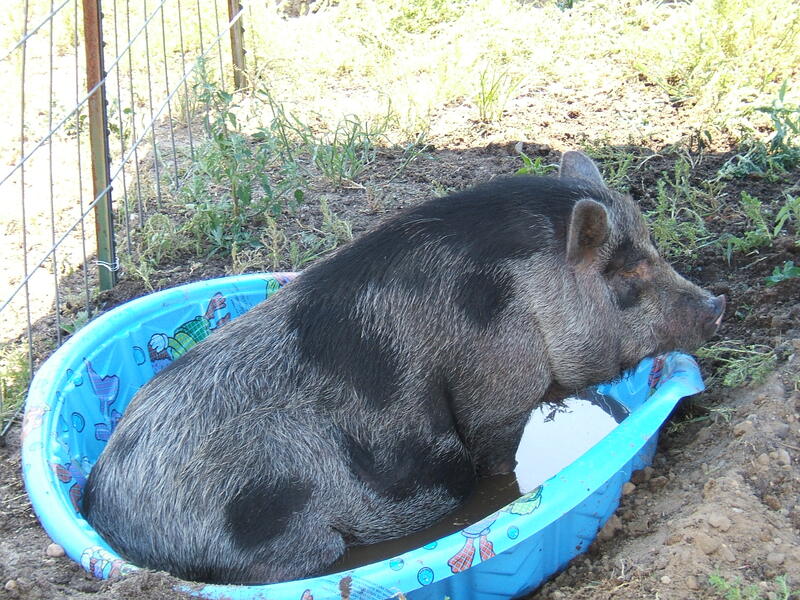 However, that said, pigs are exceptionally tidy animals and given enough space, will NOT create a “stink” in the neighborhood, nor attract flies. Most visitors to our farm are surprised when they see our pigs – their noses certainly did not alert them to their presence beforehand. 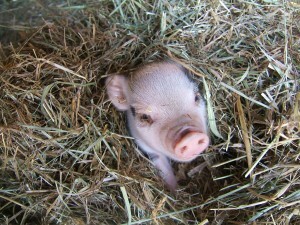 Finally, raising a pig for meat is a temporary arrangement — usually accomplished during the nicest months of the year. Most folks buy a weaned pig in the Spring, and by late Fall, he’s in the freezer. This means shelter can be simple and portable – no barn needed — just protection from the sun and the cold Spring and Fall rains. Since you are raising your pig during the “peak” production months regarding the garden, orchards, and fields, a variety of feedstuffs is available and abundant. Plus, the weather is pleasant to do chores in as you finish out your hog. By the time the harvest is over and the cold weather sets in, you are done or nearly done. There is no long-term commitment with raising a hog or two for meat. It’s an easy way to get your feet wet with larger livestock. Now, if you’d like to breed pigs, there are many, hardy, heritage breeds out there that thrive on pasture, woodlot, or a backyard sty on a small holding. Some are relatively small, staying under 300 pounds at maturity, making them manageable and less intimidating for the novice pig farmer. Intrigued? Want to learn more? Then tune in Thursday, October 10th, on the Homestead Honey Hour at 8 pm CST and join Renée (a.k.a. Michigansnowpony on youtube) and her special guest and former (forever!) Homestead Honey, Bev (a.k.a theMrsVolfie on youtube) as they discuss raising the homestead hog to help get you started on your way to producing your own, delicious, home-raised pork! Iisten to this broadcast on “The Homestead Hog” in player below! Scheduling conflicts on your new homestead.